Converting videos from one format to another one for the ultimate enjoyment shouldn't be a luxury, but a necessity. In this article, we'll cover converting M4V to MKV videos quickly and easily. Generally, converting M4V to MKV, you can gain a better playing experience on PC, HDTV, or enjoy flexible playback on devices that support MKV other than M4V. If you don't understand any encoding or decoding techniques, converting videos can be a science work. Luckily, there're many video converters available on the market to cater for your needs. And here Wondershare UniConverter (originally Wondershare Video Converter Ultimate) (Wondershare UniConverter for Mac (originally Wondershare Video Converter Ultimate for Mac)) is highly recommended due to its high quality, efficiency, and simplicity feature. 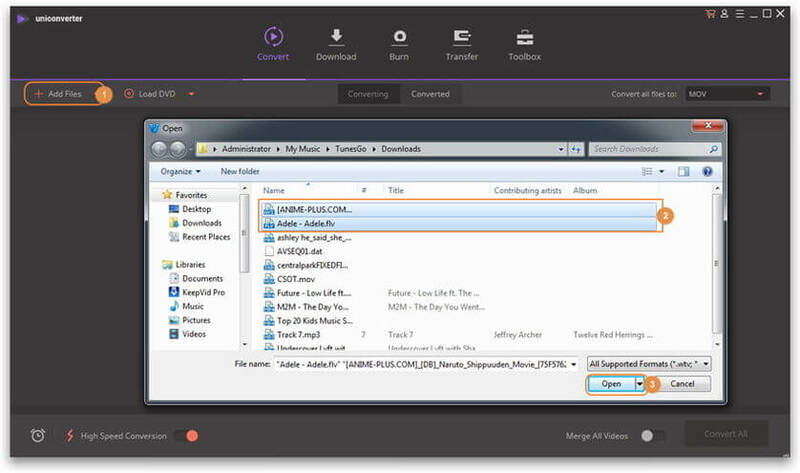 With it, converting M4V videos to or from any format is just a piece of cake for you. Now let's walk through the detailed process, only 3 simple steps. Step 1 Load M4V files to the M4V to MKV video converter. 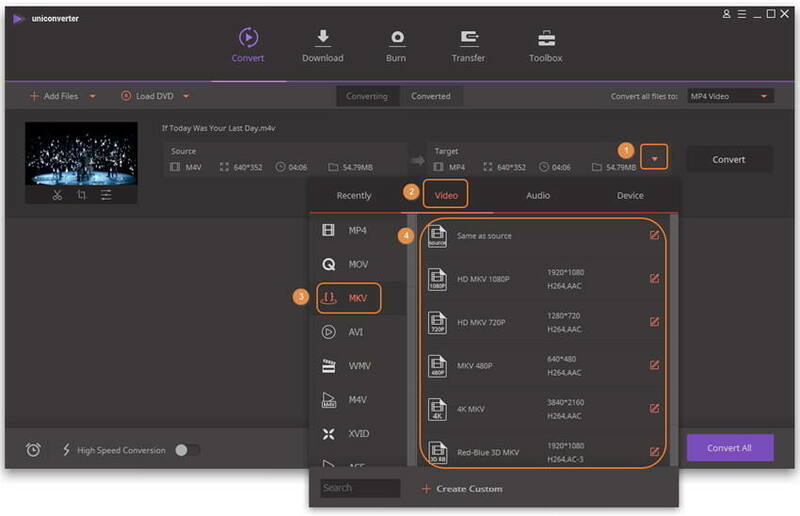 To import M4V files into the program, you can directly drag and drop them to the converter, or head to Convert tab and then select the Add Files button to add your M4V files. Batch conversion is supported so that you can import more than one media file into the program for converting. Go to the Target Output Format section and click the drop-down button, then a drop-down list will appear with tabs of Recently, Video, Audio and Devie. To simply select the MKV format, go to Video > MKV and select the specific resolution in the right. Step 3 Start the M4V to MKV conversion. To kick off conversion, just hit the Convert or Convert All button and let this video converter do the rest. It's highly efficient and the progress bar will show you the remaining time. After the conversion completes, you can enjoy the wide screen and sharp image in HDTV or your MKV players on the go. M4V is a standard file format for the popular Apple iPod devices. When you buy or download the movies, TV shows or music videos from iTunes, you'll find that they always carry the .M4V file extension and protected by Apple's FairPlay Pocliy. At present, the bought M4V files can only support playback on iTunes and iOS device like iPod, iPhone, iPad with the authorization. 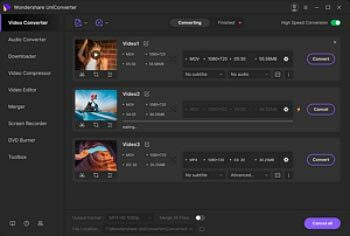 MKV, an open standard multimedia container format, can hold an unlimited number of audio, video, picture or subtitle tracks in one file. It's intended to act as a common format for storing common multimedia content, like movies or TV shows. Now you see it widely used in HD videos, and can be easily streamed over on the Internet due to its relatively small file size.